Vegetable gardeners in urban areas are faced with lots of problems such as lack of space, soils contaminated with heavy metals such as lead and arsenic, shade from trees and buildings, and soil-borne diseases such as fusarium, pythium, rhizoctonia, and phytophthora. If you have a passion for vegetable gardening, consider growing vegetables in containers. Vegetables and even flowers and herbs grown in containers can be placed or moved to any spot such as windows, balconies, patios, and doorsteps where there is full sun. 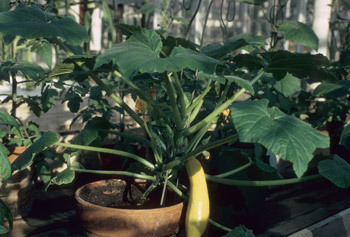 The vegetables suitable for container gardening are the ones that require small spaces -- particularly the dwarf or determinate types, that bear fruit or other harvestable parts over a longer period of time. They usually require full sun, more than six hours of sunlight a day -- or partial shade, three to six hours of morning or early afternoon sunlight a day. Most fruit bearing vegetables such as tomatoes, peppers, cucumbers, squash, and eggplant require full sun. Leafy vegetables such as lettuce, cabbage, collards, mustard greens, spinach, and parsley can tolerate more shady location compared to the root vegetables such as turnips, beets, radishes, carrots, and onions. Most herbs can perform well in full sun and partial shade locations.